Having lay dormant for the best part of a decade – Burnout Crash! notwithstanding – EA and Criterion’s arcade racer is back in vogue thanks to the release of Paradise Remastered. It’s a bumper package, too, with enough content to keep your wheels spinning and fingers twitching for weeks – if not months – and Criterion’s revival is living proof that, even after nine long years on the sidelines, Burnout‘s core gameplay mechanics have withstood the test of time. As a matter of fact, the pent-up excitement for Burnout Paradise Remastered allowed EA’s re-release to open in pole position on the UK all-format charts – the first time in 13 years, no less – where it’s already been dethroned by Ni No Kuni II: Revenant Kingdom and Far Cry 5 in the past few days. Of course, the mid-March corridor is typically a quiet time of year for the industry, but if ever there was proof of Burnout‘s continued relevance, this is it. 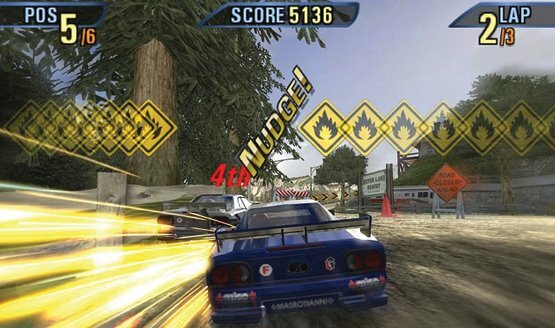 First released all the way back in 2004, Burnout 3 was an aggressive, bone-rattling thrill ride that steered the genre toward uncharted territory: vehicular combat. Yes, thanks to those oh-so-satisfying Takedowns, players were actively encouraged to smash into nearby opponents in order to receive a quick speed boost. The more cars you wreck, the longer the boost. And so, the thirst for Takedowns was born, as you revel in the slow-motion destruction. The end result was a gameplay experience so addicting – so pulse-pounding in its brilliance – that at times it was genuinely difficult to put down the controller. And then there was the Crash mode. 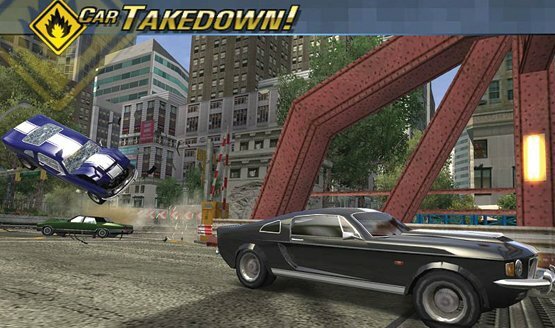 Pitched as an evolution of the gameplay mode from Burnout 2: Point of Impact, albeit with the added Aftertouch feature, Takedown‘s Crash Events allowed players to introduce a little anarchy across 100 jam-packed junctions. Fire engines and gritting trucks were sent careering through the air in what quickly became a dazzling firework display of sparks and, if you happened to collide with a Big Rig and its adjacent tanker, fiery explosions as the accompanying damage meter sky-rocketed. Toss in a 4x cash multiplier and you have all the makings of a record achievement, and it’s this element of score-chasing that only added to Burnout 3‘s replayability. Though it may err on the side of hyperbole, Criterion’s 2004 classic was arcade racing at its bone-rattling best, and the re-release of Paradise on PS4 and Xbox One only leaves me pining for that experience all over again. Just with prettier graphics. It doesn’t have to be anything too fancy, either; Paradise Remastered is living proof that a Burnout title can be just as accessible as its original release years prior, and the robust content on offer in Takedown – Road Rage, the aforementioned Crash Mode…you name it – would no doubt ensure players were given enough bang for their buck. To play devil’s advocate, perhaps Burnout would be better served with a back-to-basics reboot, or a new experience entirely. After all, Paradise Remastered marked the franchise’s first full-fledged console release in almost 10 years, so it’s fair to say that Takedown may have already missed its window of opportunity. Nostalgia can be a tricky butterfly to pin, too, as appealing to dusty-eyed players like myself with an appetite for the Good Old Days can often lead to a HD re-release crippled by dated controls – or worse, a game shoved onto PS4 (read: Deadpool) as part of a thinly-concealed marketing ploy. Here’s looking at you, Activision. If the remastered Burnout Paradise really is EA’s litmus test, what with its visual enhancements and under-the-hood tweaks, then surely – surely – the Powers That Be are mulling over the possibility of a new installment. We’ve seen it countless times in the past: a studio and/or publisher pumps out a HD revival of a dormant franchise with prettier graphics and, in some cases, a cabinet full of trophies in order to gauge user interest. It’s a way for companies to hedge their bets when mapping out the future of ‘Series X’ – or lack thereof. Sometimes that remaster is a false-start; other times it leads to a bona fide revival. With Burnout, there’s a real chance to bring Criterion’s franchise back to the fore, albeit with a new lick of paint. The demand is there, as evidenced by the release and subsequent success of Paradise Remastered. All we need now is for Criterion Games to roll the dice on Takedown PS4. Or, failing that, a sleek new Burnout experience that’s informed and indeed inspired by the incredible game modes and pulse-pounding action that defined Burnout 3: Takedown, one of the best and most accomplished arcade racers ever made. Sure, Three Fields Entertainment catered to that same sense of nostalgia with Danger Zone, an indie car game partly inspired by the Crash Mode of Burnout 3 in that it allowed adrenaline junkies to earn money for their mayhem. It was a bright and breezy experience that became available for PS4 and PC, but just imagine if Criterion Games, whose credits include Star Wars Battlefront II and Battlefield 1, were given the freedom to dump all of the necessary resources into a current-gen version of Burnout 3: Takedown. Wishful thinking? Maybe, but in light of Paradise‘s re-release, I’m inclined to believe it’s not off the table, after all.